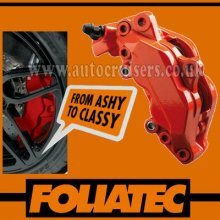 Foliatec Brake Caliper gives your brake calipers a sporty look. It will also permanently seal and protect the surface of your calipers. § Sufficient amount for 4 calipers and brand new in original packaging. § Included in the pack: 150g tin of paint lacquer, 400ml spray cleaner, 50g tin of hardener and instructions. PLEASE NOTE: The colour in the image is for illustration purposes only. The actual colour of the paint may differ depending on application method or when dried. Please note: Aerosols cannot be sent via Royal Mail as they are classed as hazardous material. Due to royal mail restriction this item can only be sent via an approved courier. Courier delivery to UK mainland is free and on for details on courier surcharge to Islands, highlands and N.Ireland please see our terms. Courier delivery to UK mainland is free and on for details on courier surcharge to Islands, highlands and N.Ireland please see our terms.